Did Flipkart just break the hubris meter? Hubris is back in India’s e-commerce industry, and from the looks of it, it’s worse than ever. Flipkart’s chief executive officer (CEO), Kalyan Krishnamurthy, said in an interview with Mint, “(Cash) burn is not a metric that anybody worries about any more. And with the fundraise, burn is almost irrelevant." Flipkart’s cash reserves have risen to more than $4 billion after large investors such as SoftBank, Tencent Holdings and eBay pumped around $2.8 billion into the company this year. It’s evident why Flipkart’s CEO is sounding smug. But to assume that investors aren’t bothered about burn any more is taking things too far. While the funding tap has been gushing this year, investors have been more discerning—the list of investable companies has been whittled down considerably, and valuations are far lower compared to the peak of 2015. Flipkart’s valuations in the latest funding rounds were lower by about a fourth compared to its peak valuation about two years ago. 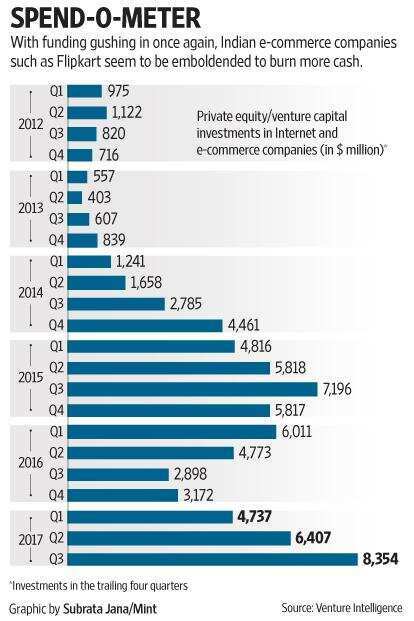 And not long ago, when the funding tap had effectively dried up, e-commerce companies had been forced to shift their focus to unit economics and other efficiency parameters. Flipkart itself had said in a meet organized by an investment bank in late 2015 that its cash burn has reduced by around 25% from peak levels. But when burn reduces, so does growth; which is what Flipkart experienced in 2015-16. To remedy this, the company has been betting big, again, on smartphone sales. While the strategy has taken Flipkart to the top of the turnover league table, it is a myopic view of things. According to an analyst at a domestic institutional brokerage firm, Flipkart is missing the big picture by adopting a transaction-based business model, rather than a relationship-based model. Incidentally, Amazon India, with its Prime membership offering and add-on products such as Amazon Pantry and Amazon Now, has been far more successful in building customer loyalty. Flipkart, says the analyst, may be used to get a good deal on a smartphone, but may well be forgotten for most of the remainder of the year. The company is evidently handicapped without an offering such as Amazon Prime, which throws in free content and helps ensure customer loyalty. Besides, the obsession with smartphones is troubling because profitability is either wafer thin or absent in the category—all it tends to do is bloat revenues. To be sure, Flipkart’s ability to deliver on strong sales growth might have attracted large investors in the first place, and can’t be completely rubbished. But at the same time, the strategy can’t deliver long-term value. It’s high time the company rolled out a strategy for sustainable growth.